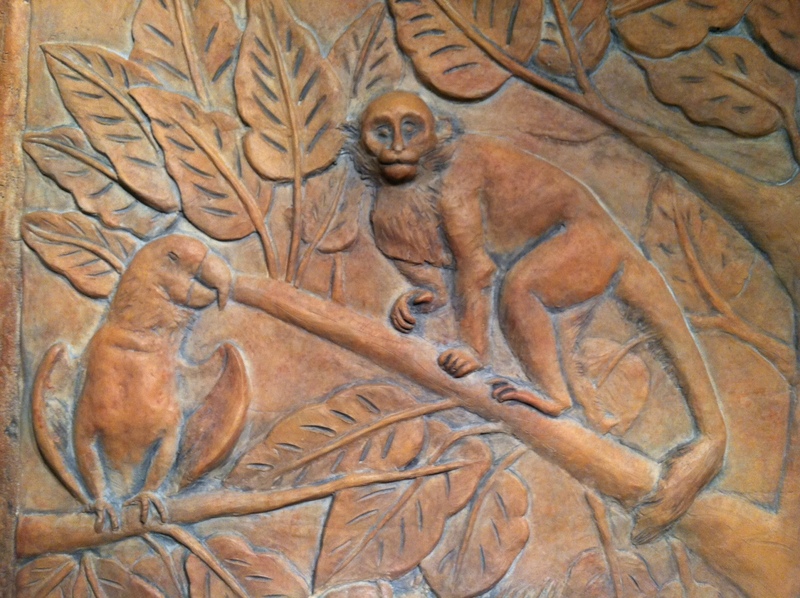 Bring the Amazon Rainforest into your Home or Architectural space with a hand-sculpted CONCRETE JUNGLE! Made with reverence for the beauty of the Rainforest and the animals who live there, this work of art depicts a gathering of animal friends in the tropical Amazon Rainforest. Here you’ll see a Tucan, an Iguana, a Frog, a Monkey, Parrots and mischievous Coaties gathered around a tree to play and celebrate life in the jungle. 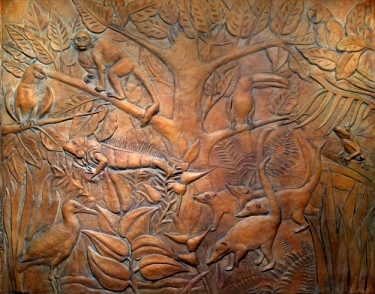 The sculptural relief measures approximately 5′ x 4′ and can transform just about any wall space into an exotic landscape. The outer edges of the jungle tree bark can extend to almost any size, making this mural a perfect site-specific design solution for homes and commercial sites alike, including hospitals, schools, restaurants and lobbies. 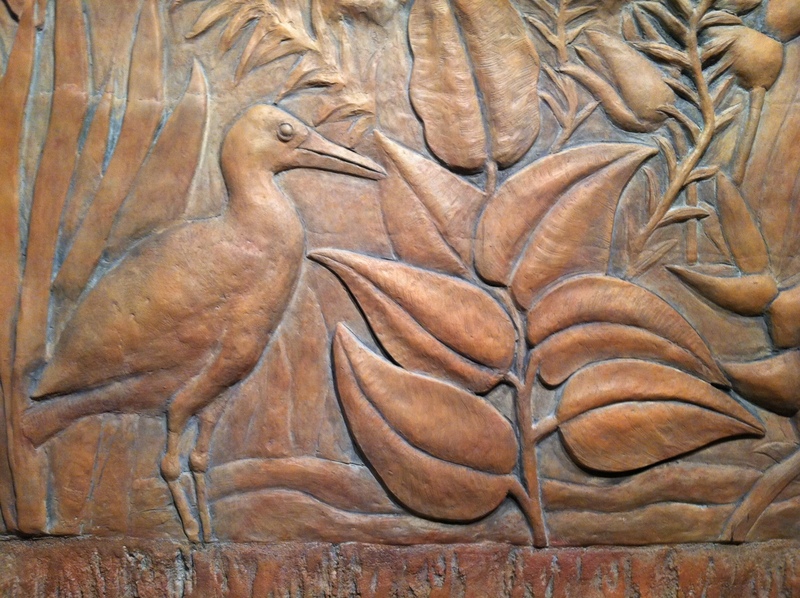 Our Concrete Jungle was first designed and sculpted as a three-dimensional relief in clay. 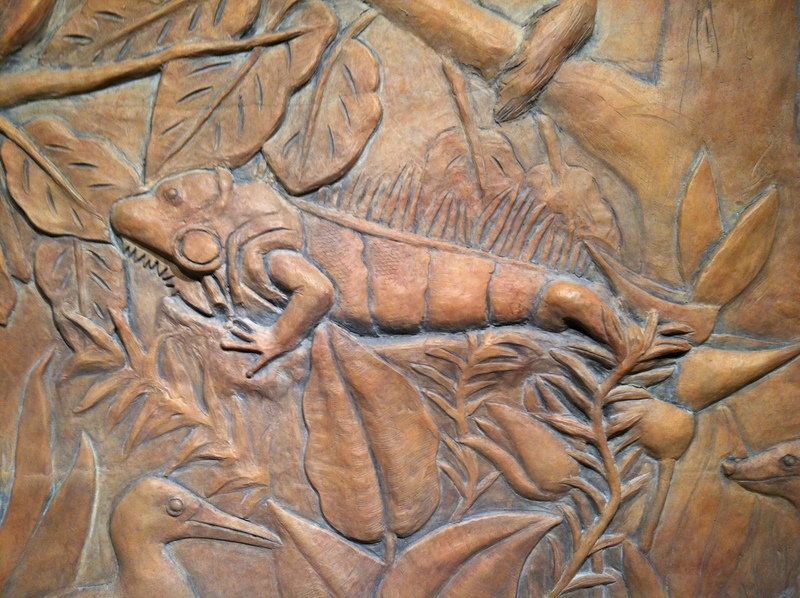 We then created a mold by applying several layers of rubber on the the sculpted relief. This allowed us to make original casts using GFRC (Glass Fiber Reinforced Concrete), which is an amazing material. It’s stronger than concrete, but 70% lighter in weight. The nuances of our materials and hand-staining process ensure unique character and individuality for each and every one of our installations. The energy and mood of each Jungle can be dramatically or subtly defined by lighting, as certain dimensions are enhanced and brought to life while shadows create depth and mystery within the environment. If you would like to learn more about our process of creating the “Concrete Jungle” please visit our video for some rare behind-the-scenes footage! Our Concrete Jungles are durable, fireproof and will last a lifetime. 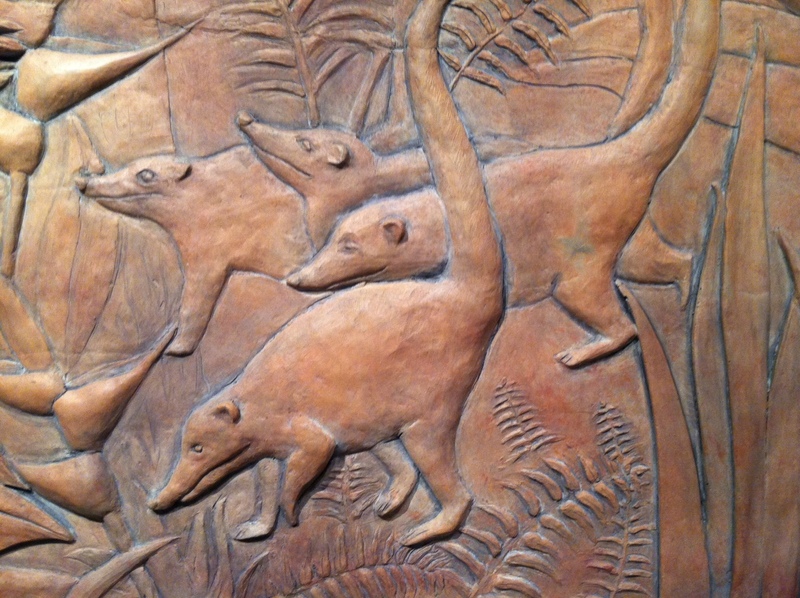 They can be installed as a permanent wall mural or as a framed removable relief sculpture. 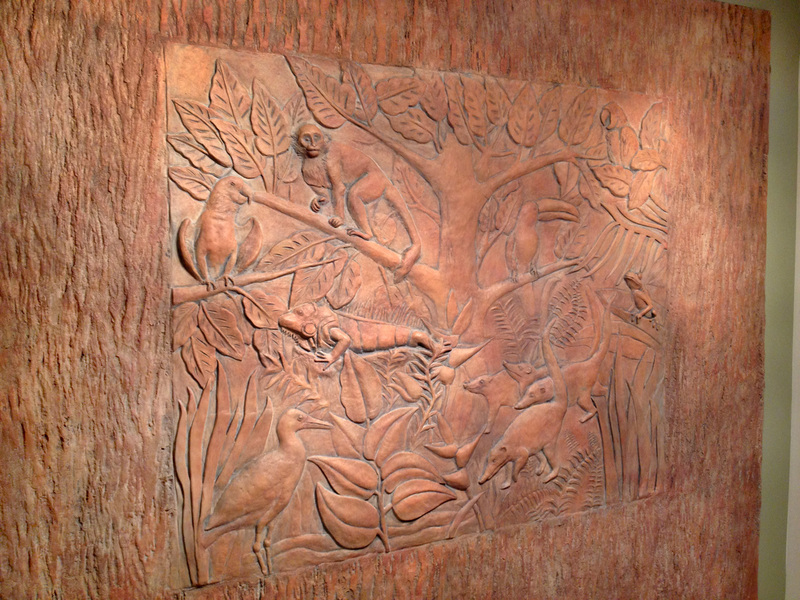 Pricing for the Concrete Jungle wall mural starts at $7,800, and is determined by the final size. 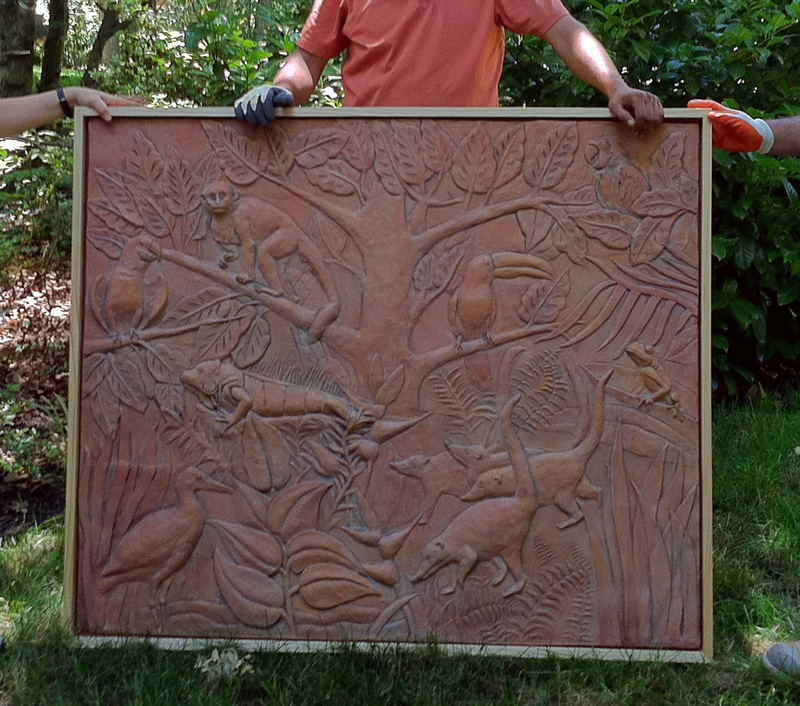 Pricing for the framed relief sculpture starts at $3,500, depending on the choice of frame. Prices for both options include delivery and installation in the DC metropolitan area.